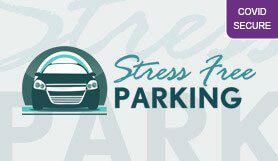 Save time & hassle with Stress Free Parking - it's the most convenient way to park your car at Birmingham. Stress Free Parking at Birmingham offers a premier meet and greet service for passengers flying to and from Birmingham airport. The service takes the hassle out of airport parking by allowing you to drive straight to the departure terminal where you’ll be met by a representative. The car park where your car is stored is manned with 24 hour security, regular patrols, barrier, CCTV and high perimeter fence. Please take a print out of your booking confirmation with you when you travel. Please ring using the number on your confirmation email, 15 to 20 mins before arriving at the Airport. When you arrive at Birmingham International Airport, stay in the right-hand lane and follow it all the way to 'car-park 3 Valet Parking'. Go through the barrier and collect a ticket to hand to your Stress Free / Maple Parking chauffeur. Park your vehicle in the designated Maple Parking bays and a uniformed chauffeur with ID will be there to collect your vehicle. Once You have collected your luggage, Please call Stress Free using the number on your confirmation email. As you exit the terminal building, follow the signs to car-park 3 Valet Parking (where you dropped the car off). Your vehicle will be returned to the designated Stress Free / Maple Parking bays. A uniformed chauffeur will return your vehicle.